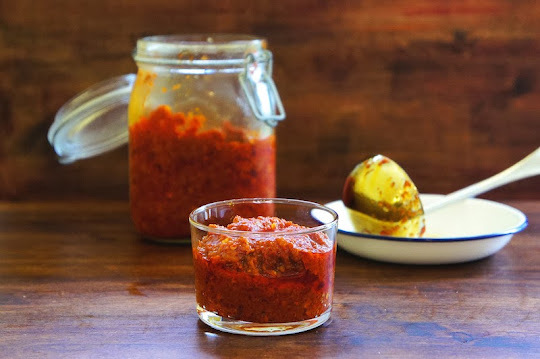 This Sambal Paste With Lemongrass is one of my favorite recipes. It is aromatic, spicy, and it's great to cook with chicken, seafood or vegetables. You'll be surprised by how versatile this simple sambal paste is, it can be turned into many mouth-watering dishes. Which, I will share with you too. Process all the ingredients (except palm sugar and tamarind paste) until smooth. Heat about ¾ cup of more oil in a wok over medium heat. Fry the sambal until it is aromatic, and the oil starts to separate, and remember to stir continuously. Then season the sambal with tamarind paste, palm sugar, and sea salt. Angie, is this the sambal you were telling me the other day? You can keep it in the fridge for a week. On the other hand, you can wrap them into an individual package with plastic wrap, and it will last at least four months in the freezer.